In deep fryer or 3-quart saucepan, heat 3 to 4 inches oil to 375°F. 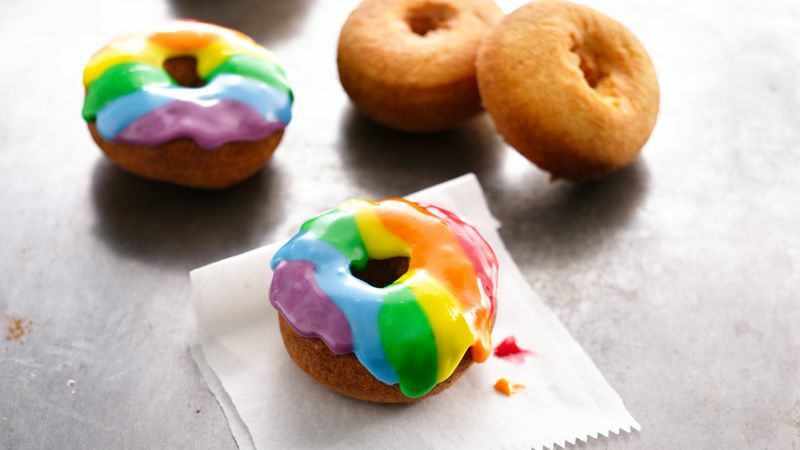 In large bowl, beat 1 1/2 cups of the flour and the remaining ingredients except Rainbow Doughnut Icing with electric mixer on low speed 30 seconds, scraping bowl constantly. Beat on medium speed 2 minutes, scraping bowl occasionally. Stir in remaining flour. On generously floured surface, roll dough lightly to coat. Gently roll to 3/8-inch thickness. Cut dough with floured 2 1/2-inch doughnut cutter. Fry doughnuts in oil, 2 to 3 at a time, turning as they rise to the surface. Fry 2 to 3 minutes or until golden brown on both sides. Remove from oil with slotted spoon; drain on paper towels. Cool slightly and frost with doughnut icing. These old-fashioned doughnuts are perfect for dipping into your favorite hot beverage. If you’d like to make buttermilk doughnuts, you can substitute buttermilk for the milk, decrease the baking powder to 2 teaspoons and add 1 teaspoon baking soda. The doughnuts are also great plain or just sprinkled with granulated or powdered sugar instead of the icing.